I had a hard time deciding what to show for Bloggers Quilt Festival. I missed the spring edition, so I had quite a few quilts to choose from, but ultimately, I only wanted to show one, my favorite quilt, my mariner's compass mini quilt titled A Light in the Dark. This quilt was inspired by my love of text fabrics. When I first saw Violet Craft's Madrona Road line at Spring Market, I knew I had to do something with her charcoal/black memoir print. I bought several yards of it when it first came out, and it sat unused for a bit, trying to think of a fun way to use it. As I started preparing mini samples for Sewing Summit, I decided I wanted to tackle a few Mariner's Compass blocks, and I thought the print would make a great background. I spent a good bit of time carefully cutting and placing each piece so that it would give a sense of movement throughout the quilt. Using a black print for the background made me think of Amish quilts and their often vibrant use of solids, so I used some of V & Co's Simply Color ombres, which gave me the ability to cut several different shades of each color I was using from one single cut off the bolt. 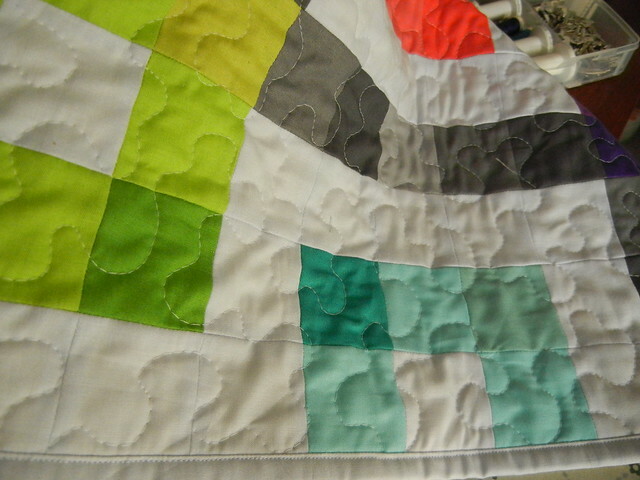 While I adore the piecing in this quilt, I think the free-motion quilting might be my absolute favorite part! 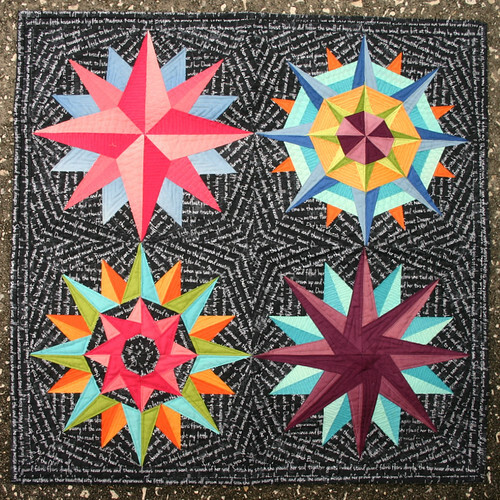 The four different blocks in the quilt each have their own different styles of free-motion quilting accenting the different solids. The background is quilted in black thread, in a micro stipple, throughout the quilt. The Which Way North block features four different FMQ techniques: a simple FMQ echo on the blue outer points, an infinity FMQ on the lightest pink spokes, a wiggle FMQ on the darkest pink spokes, and a pulley styled FMQ on the medium pink outer points. That pulley style was so much fun to do, I definitely want to try it on something larger soon! 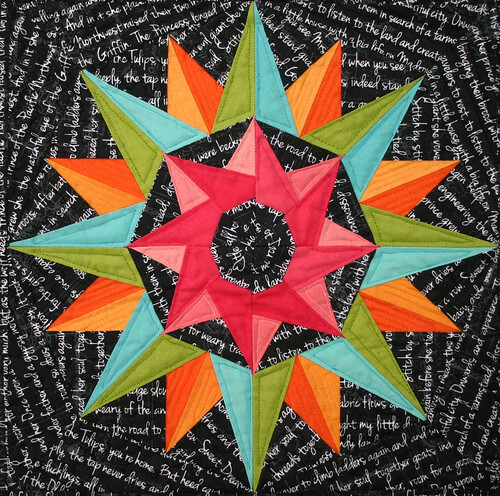 The Kaleidoscope block shows two different styles of FMQ: a simple FMQ echo on the green, blue, and pink points, and a wiggle on the light and dark orange points. I love how colorful this block is. 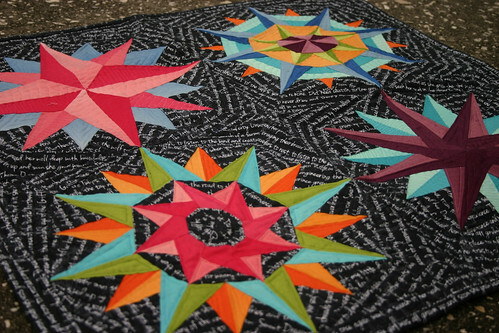 The Wheel of Fortune block is quite possibly my favorite, because of the scale of the quilting. These are only 12" blocks, and some of the segments of the block are as small as 3/4" wide. The orange, blue, green, and purple points have a simple echo FMQ, the light aqua points have a teeny-tiny infinity FMQ stitch, the medium aqua is done in a teeny-tiny wiggle FMQ, and the light orange is also done in a wiggle. 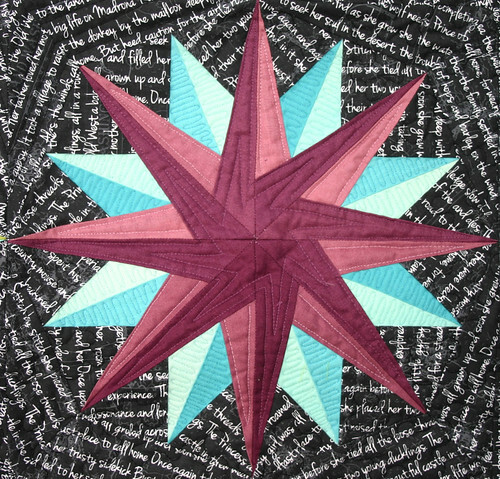 The Spinning Points block uses two styles of FMQ: a simple echo FMQ for the purple points and a wiggle FMQ for the aqua points. I love the icy cool feel the aqua and purple give this block. I think what really makes the quilting work on this mini is the coordinating threads for the quilting. This is the first project I've ever done that on, and after seeing the way Angela Walters' quilting gives such depth and texture by using coordinating threads, I might just be a convert to doing that. I say might because burying all those starts and stops in eleventy-million different shades of thread was a bit irksome, to say the least! But I love the final effect, so I suspect I'll be using coordinating thread in the future. Maybe not always, but it feels good to have strayed away from my usual white quilting thread. 1. This is my first real quilt pattern. I have written a full PDF pattern, available here, so you can make your very own Fabricland! 2. This quilt is based on some doodles my late father used to draw. It reminds me of him, and makes me feel close to him, even though he's been gone for several years now. 3. 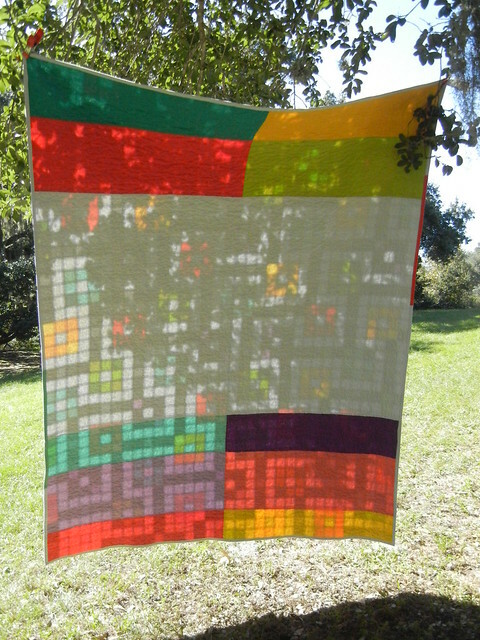 I am really loving solids these days, and the solids I used here are Free Spirit Solids, which are super buttery soft!! I really enjoyed working with these solids, I will definitely use them again! My dad was a really big part of my life. He died in my early 20's, and as an adult, I often think of him and wonder what he would think of what I'm doing. When it comes to my quilting, I know he'd be super proud of me for finding something I enjoy so much. And he would be super proud of this quilt, I know it would make him smile. My dad worked two jobs for most of my childhood and both involved a lot of time on the phone. One job was in sales and the other in the telephone survey industry. My dad was the kind of guy who liked to use his hands...all the time. If you went into his office, more often than not, if was on the phone, he'd have a pen in hand with a notepad, and would be doodling a pattern similar to this quilt. I've found myself doing the same thing in the last year or so, and that was my inspiration for this quilt. I started with a bunch of quilty math and diagrams, talked to the lovely Brenda at Pink Castle Fabrics about my fabric needs, and thus, a quilt was born. This quilt is comprised of 1,420 little squares, placed just so to create a fabulous repeating pattern. I chose a light, medium, and dark value variation for each of the colors I was working with, which creates a neat, sparkling kind of effect to the quilt. 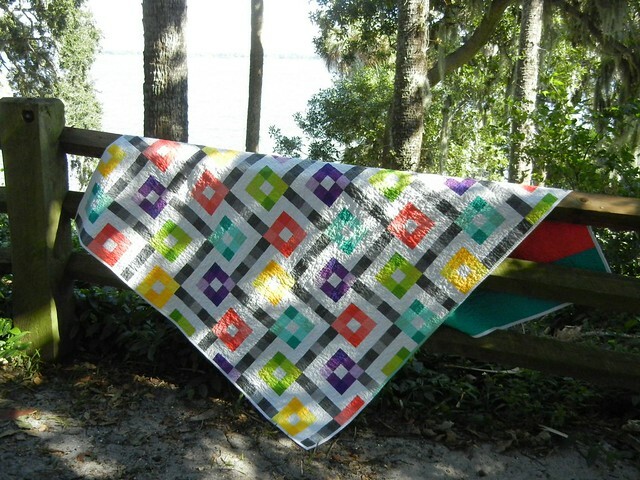 And now for the shameless self-promotion...you can purchase my e-pattern at my new pattern shop or you can purchase a kit for this quilt right here at Pink Castle Fabrics. The Fabricland PDF pattern includes all of the information you'll need to make this quilt, including color photos and complete piecing diagrams to follow, as well as requirements for batting and binding. The finished size of this quilt is 70" x 80". The kit includes all of the fabric you'll need to complete the quilt top, as well as the e-pattern. Pattern: Original design by me, available for purchase here! I hope you are enjoying Bloggers Quilt Festival! Last fall was my first Bloggers Quilt Festival. I was a fairly new blogger, but I was positively smitten with the quilting community online, and BQF really sealed the for me. Not only did I love the opportunity to share this hobby that I was quickly falling in love with, but it was really clear to me that this community is so open and giving and welcoming. 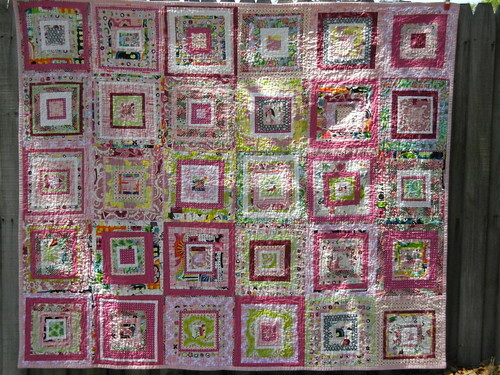 I know I'll be checking Amy's BQF linky post frequently over the next week so I can see all of the other amazing quilts that will be shared there. 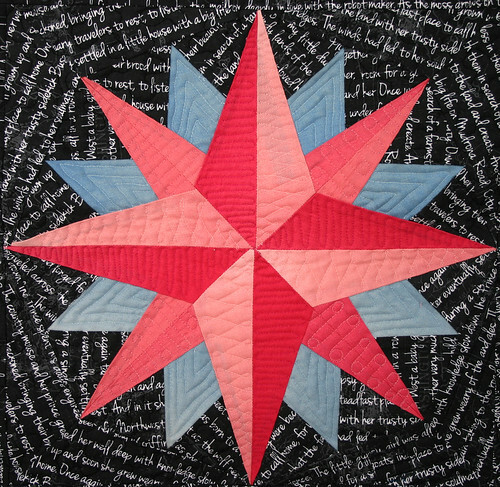 If you haven't written a post and shared a quilt yet, do it. Even if it's not a quilt you just finished, share it. I know I'd love to see it! 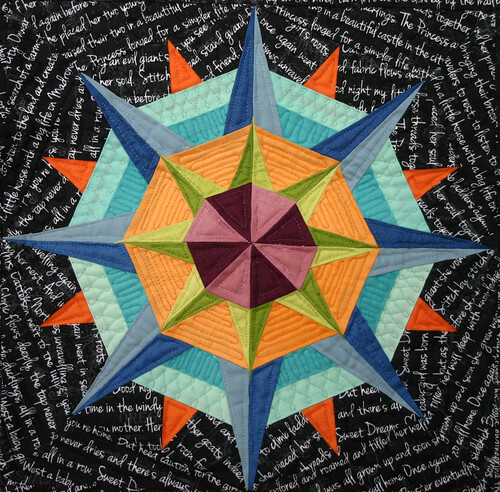 I debated long and hard on what to write about this week for the Blogger's Quilt Festival. 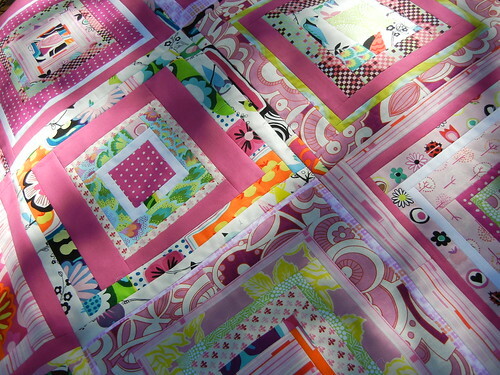 I've been quilting like a madwoman all week, trying to finish a new quilt to feature today. Somehow, thanks good coffee and Jimmy Fallon, I'm super excited to share this quilt with you, my hot-off-the-sewing-machine, newly finished 12 Charming Days of Christmas quilt. Using a charm pack of Kate Spain's 12 Days of Christmas and some Kona basics, I feel like I made a super fresh modern quilt, and I'm so thrilled to share it today for Amy's Creative Side's Blogger's Quilt Festival! I challenged myself a lot with this quilt, and that's part of why I'm so proud of having finished it. 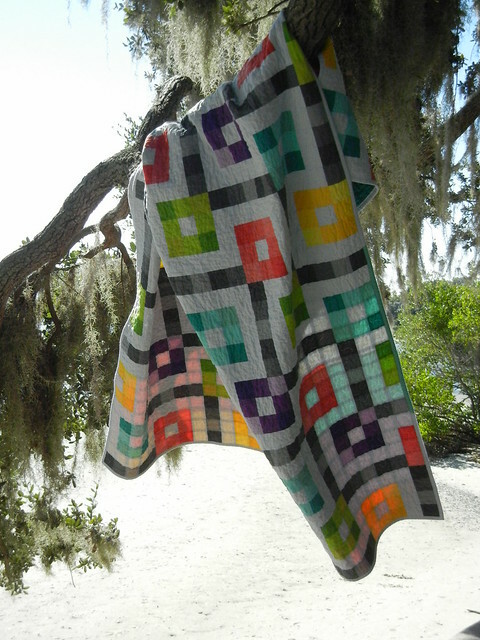 I created the pattern myself, using Ashley's quartered squares tutorial as a starting point. I adapted it so I could work with a charm pack, and next week I'll be posting the tutorial if you want to make blocks like these ones with charm packs you may have amongst your stash. 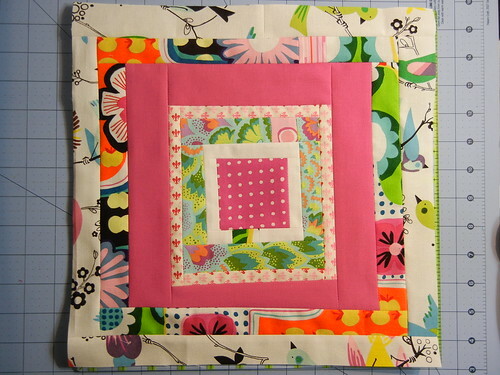 This block translates into an awesome throw pillow! Figuring out the math was a nightmare at first, and I joked with my husband that I was using all of that algebra I swore I would never need in school. I had him help me with a lot of the math, and despite his lack of quilting knowledge, it was a big help. It's become abundantly clear that I will not be the parent helping with math homework in our household! This was also the first quilt that I sketched. After I created the block, I wasn't sure where to go with it, so I got out a composition book and just started sketching. 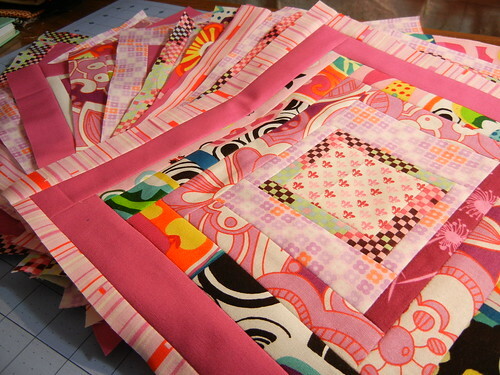 Did I want to do a whole quilt of these blocks? 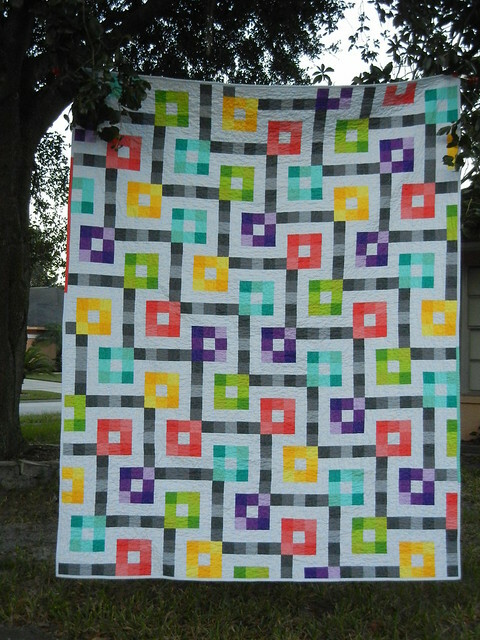 Do a quilt with just one block in the center? Try to make 12 blocks, like the 12 days of Christmas? Maybe just some quilted throw pillows? I ultimately decided against that, and made 5 blocks, framed them with some Kona Coal and sashed them in Kona White, for a super sleek quilt top that really lets the blocks shine. I am really in love with how this quilt turned out. I'm feeling a lot more confident in my design skills now, and am sketching several other projects in that composition book of mine. I straight-line quilted this quilt, which is a new concept to me. All of my big quilts have been stippled, and I enjoy stippling, but I felt like this quilt needed a more simple approach to the quilting. I've quilted a few small mug rugs and a doll quilt using straight lines, but this was the first sizable attempt. I used a boatload of painters tape, and I'm really pleased with how it turned out. It was definitely a challenge, trying to keep things semi-straight, but my lines definitely have a dash of wonkiness to them. It's a good thing that I enjoy that kind of thing! I learned I still need to work on my basting skills - there are a few wrinkles on the back of the quilt, all said and done. I just read an awesome tutorial on spray basting over at Stitched in Color, and I think I may try that next time around. I learned that I also need to slow down when it comes to binding - I get so excited about finishing sometimes that I make silly mistakes. I had to rip out a a zillion stitches on the binding, which was nothing short of irritating. Lesson learned, though. Slow down! All in all, this is definitely my favorite quilt that I have made to date. It makes me want to start decorating for Christmas, even though it's not even Halloween yet. 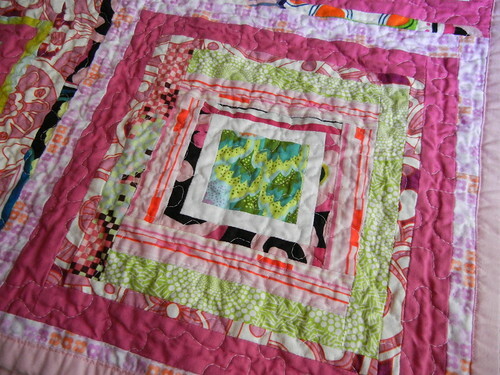 I can't wait to start blog hopping around to see all of the other quilts in the festival. You can still join in, just visit Amy's Creative Side for more details and to find all of the other blogs participating!